Heavy-duty punch features a large T-shaped handle for greater leverage and nontip base. Hole punch drills two to four 9/32" holes in up to 40 sheets. Heads adjust out to 10-1/2" centers to punch letter, legal or A4 European sheets. Easy-to-adjust knobs lock for accurate hole alignments. 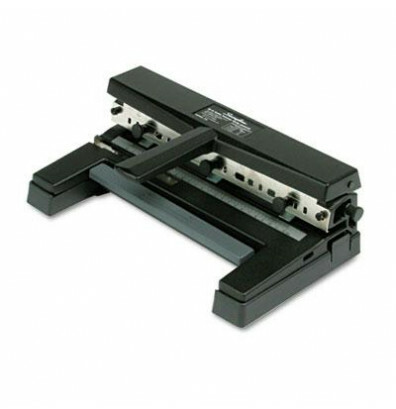 Punch includes four punch heads to fit A-2 and A-4 paper and accepts up to seven punch heads. Metric, calibrated positioning guides allow precision. Large-capacity chip tray pulls out for easy emptying. Heavy-duty punch offers adjustable centers and die-cast steel body.